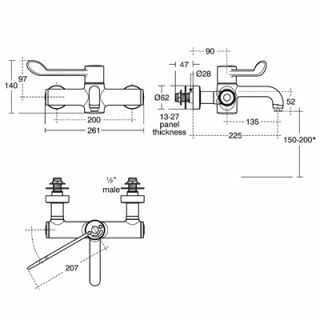 Armitage Shanks Markwik 21 Thermostatic hospital tap. Conforms to HTM64 (2006), HTM04, HFN30. Fitted with Bioguard outlet which reduces the opportunity for bio film attachment and is lined with anti-microbial copper. Insulated body to prevent danger of burns. Long lever for wrist or elbow operation, 180 degree sequential action. Replaces the Markwik A4553AA model. 2 x 22 mm tap holes at 200 mm centres required. To see the full range of slop hoppers and hospital sinks.